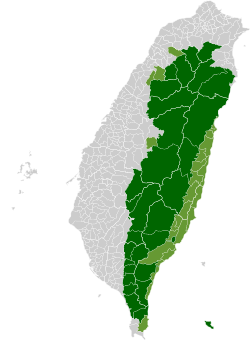 Shitan Township (Chinese: 獅潭鄉; pinyin: Shītán Xiāng) is a rural township in Miaoli County, Taiwan. It is located in a mountainous area with a mild, sub-tropical climate. Its rainy season is from May to September. Shitan is short on medical resources. It does not have a hospital or clinic, so people often have to travel to Miaoli City to get health care services. Shitan's population was estimated to be 4,468 in January 2017. The area was occupied by native Taiwanese through the 19th Century with an economy strongly dependent upon hunting. In 1876 under Qing rule, the Chinese began to build bullock roads into the area. However it was not until the 1930s, during Japanese rule, that standardized roads began to be constructed. The first motor vehicle road was completed into Shitan in 1939, and regular bus service was started. However, by 1942 the bus service had ended because of fuel rationing. The township comprises seven villages: Boshou, Fenglin, Hexing, Xindian, Xinfeng, Yongxing and Zhumu. The Shitan Village Historic Museum preserves a Hakka dwelling from the Koxinga period. Mesona (仙草), specifically Mesona chinensis, which is served as a hot, viscous drink, or curded and served over ice as a type of grass jelly. Shitan is served by provincial highways No. 3 and No. 72. Wikimedia Commons has media related to Shitan, Miaoli. Note: On the map, "Mountain Indigenous Areas" are in dark green and "Plains Indigenous Areas" are in light green. This page was last edited on 26 November 2018, at 18:20 (UTC).